After the fighting of the Proxima war, the enemy has blasted tunnels in the Quasar defence system. 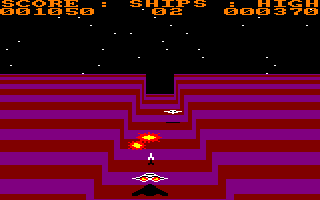 You have been sent to fly along these tunnels in your Tarantula C1 spaceship and have to shoot all the enemy craft. It's tough going right from the start – even with only one enemy coming towards you at a time, you'll need to be alert. You'll soon find that it's really tough, and soon you're overwhelmed; if you can survive for more than a minute, you're doing well! It might be worth a few goes if you're looking for a very short game to play, but there isn't any variety in it at all, and the tunnel is too narrow. 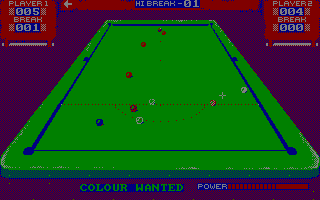 Most snooker games view the board from above. This one dares to be different by viewing it from one end and adding some perspective. However, it just doesn't work. Aiming your ball is like most other snooker games – you move crosshairs about the table and fire. The perspective makes aiming the ball accurately impossible, especially when you're aiming for a ball at the far end of the table. It also uses only four colours, so working out the other coloured balls can be tricky. The 3D graphics are a reasonable attempt, but I'll say again that it doesn't work in a snooker game. Prepare for a biased review – this is in my top three favourite CPC games ever! There is so much to this game, I can't do it justice in such a small space. You play a special agent whose mission is to deliver the CHAOS weapon (Complete Hostile Alien Obliteration System) to the scientists of a distant planet overrun by hostile aliens. But things aren't that simple and you'll find yourself making many trips to other planets before you eventually deliver the weapon. The game itself is a 3D shoot-'em-up where you must shoot the rapidly approaching alien ships using a set of crosshairs, before they crash into you and drain your shields. 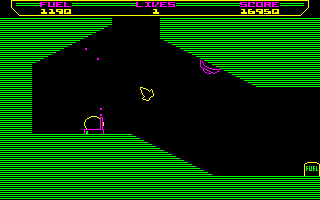 The graphics are fairly simple but still good, the sound is excellent (cue the Code Masters trademark sampled speech!) and this game is just brilliant fun! 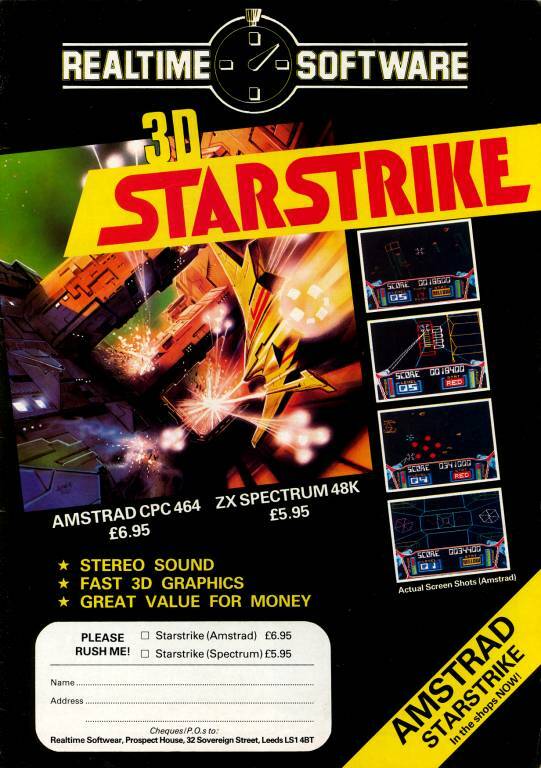 Take on the enemy Outsider spaceships in your advanced Starstrike spaceship, and penetrate and destroy their reactors hidden deep beneath the surface of the Outsiders' moons. This 3D space shoot-'em-up features fast and colourful wireframe graphics and non-stop action – whether it's shooting the Outsider spaceships and their plasma bolts, dodging towers as you fly towards the enemy base, or avoiding the catwalks as you zoom along the equatorial ducts leading to the reactors, you'll need to have quick reflexes and a good aim! While the gameplay may ultimately be a little repetitive, it's still great fun to play and an excellent choice if you're looking for a quick session of blasting aliens. With hindsight, it's amazing that people could sell full-price games that were as bad as this. The only thing to do here is trying to jump with your bike over double-decker buses (which proudly bear the inscription 'AMSTRAD'). The problem is that you must start your jump exactly at the right speed, if you don't want to crash either on the buses or on the landing track. And when I say exactly at the right speed, that's exactly! 25mph instead of 23mph won't do. 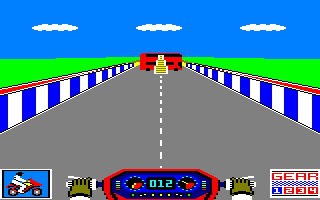 Add to that the impossibility of controlling accurately the speed of your bike, and you obtain an extremely irritating game, even if the graphics are rather good! Aliens have destroyed your home planet, and you must rid your galaxy of them. The galaxy consists of 64 sectors laid out in an 8×8 grid, and you must explore the sectors and search for the aliens using your long range sensors. 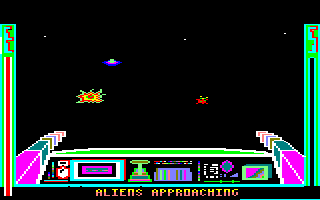 Once you find a sector containing a wave of aliens, you have to shoot a few of them by moving a cursor around the screen, and then you can teleport to another sector to continue your mission. There are also planets where you can restore some energy, but only if you land your spacecraft successfully. This is a very simple game with basic graphics. The gameplay requires very little skill and offers little variety, and it won't be long before you'll become bored of it. 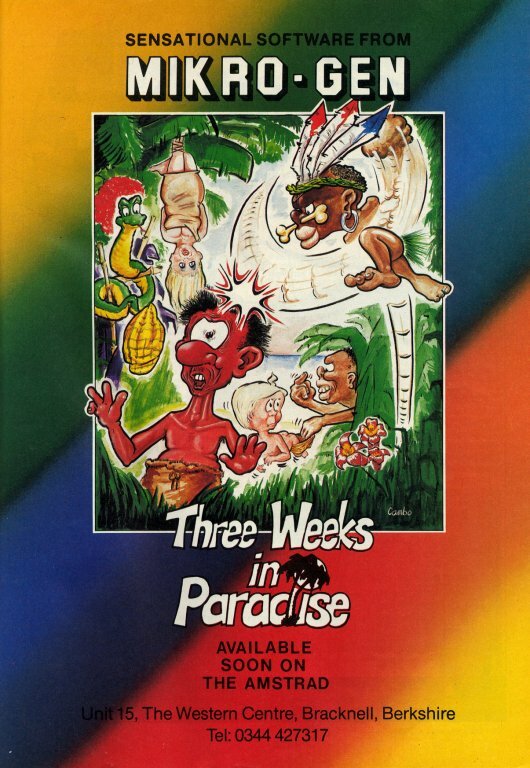 To enjoy Three Weeks in Paradise, you must be a fan of 'Dizzy-like' games and be ready to rack your brains to solve complicated riddles. Your goal is to release your friends who have been caught by a tribe of cannibals. To this purpose, you must collect items and find how to use them. The game has good MODE 0 graphics and nice animation. Unfortunately the sound is a bit weak, and above all, the game is very hard. Nonetheless, there is a peculiar compulsion to try to go further into the game. See also: Everyone's a Wally, Pyjamarama. Throne of Fire is a one- or two-player game where you choose from a roster of three identical Princes, and must explore the many rooms of the vast Burning Citadel, fencing with rival knights, in search of the ultimate symbol of power, the Throne of Fire. The various rooms are colour-coded in a small map to signify which Princes control which rooms, with the aim being to control all the rooms, by defeating the knights therein, before seeking the fabled Throne. 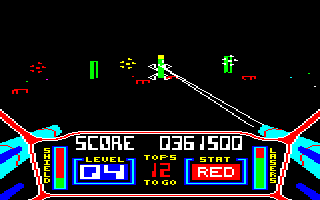 It doesn't look too bad for a Spectrum port, and the difficulty is set about right, but the sound is abysmal, it's too sluggish, the sword-fighting element is flawed, and it's just not hugely interesting. Boni the skull has been taken away below the trap door, and as Berk, you have to rescue him. This time, you can take control of both Berk and Drutt, who have to work together to make progress. Unfortunately, the game isn't as good as The Trap Door; for whatever reason, it's not as much fun. Berk may move faster, and there may be more monsters to encounter, but once you get to the second level, you'll find that things become much too difficult. See also: The Trap Door. The resistance has captured some spaceships in preparation for an attack against the Intergalactic Empire. However, they need to collect some Klystron pods for the spaceships to be useful. You control a spaceship and have to enter an underground passageway to collect a Klystron pod on each level, and then fly to the surface again with the pod in tow. However, each passageway contains guns which will fire at you, and the levels quickly become harder, with narrower passageways, more guns, and even reverse gravity and invisible walls. This simple little game is in fact one of the all-time classics. 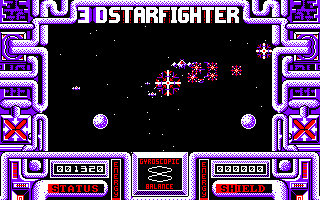 Despite its very retro graphics, it's unbelievably addictive, and if you haven't played it, you haven't lived.